As the largest infrastructure project in Mississauga's history, the Hurontario Light Rail Transit (HuLRT) will bring approximately 20 kilometres of reliable, rapid transit to Mississauga and Brampton. It will change the way people connect and move across our vibrant neighbourhoods. In 2016, the City partnered with Metrolinx to identify key HuLRT stop locations and began work on their design. These stops will become key community spaces along the Hurontario corridor. They will help travelers experience and enjoy our diverse neighbourhoods as they travel between destinations in Mississauga. Moving forward, the project team will present the bidding teams with design parameters of the stops and surrounding public areas. 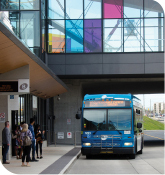 In 2016, MiWay provided additional transit options in the city, with the openings of Tahoe and Etobicoke Creek Transitway Stations. The transitway is an example of a preferred, affordable and accessible transit choice for the City and residents. The new service saw significant growth in 2016, as daily weekday ridership increased by 70 per cent. The final stations set to open in 2017 include Winston Churchill, Spectrum, Orbitor and Renforth Gateway. The Transitway expansion will provide service integration with GO Bus Services. The MiWay Five Transit Service Plan (2016-2020) launched in 2016. The plan will move Mississauga's transit system to a grid network by 2021, allowing for more buses and increased service along main corridors. In the first year of the plan, MiWay added 31,000 hours of bus service, increasing the total number of service hours to 1.48 million. Overall, MiWay achieved a 93 per cent system-wide, on-time performance rate in 2016, demonstrating the City's commitment to enhanced customer service. MiWay staff also held open houses to share Year Two of the MiWay Five plan with residents and transit riders. Plans for Year Two include an additional three per cent service hour increase and a transitway integrated network. 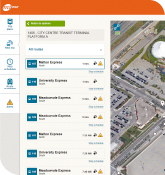 Planning MiWay trips is now easier with online access to bus information in real time. In 2016, MiWay introduced the "Plan A Trip" responsive website, offering real-time bus information on multiple devices. Riders can now access route and network information in real time while waiting at transitway stations or the City Centre Transit Terminal. 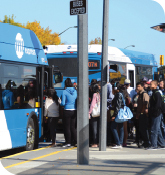 In 2017, MiWay plans to integrate bus tracker information with the "Plan A Trip" street maps. 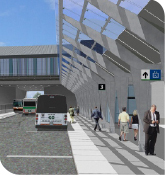 Construction for the final four Mississauga Transitway stations got underway in 2016. Winston Churchill, Spectrum, Orbitor and Renforth stations will open in 2017. The completed transitway will give riders access to GO Transit, MiWay and TTC local bus service. Direct routes to various GTA destinations, including Toronto Pearson International Airport, will also be available. By connecting major destinations using a roadway dedicated to buses, transit users will experience faster and easier travel. When complete, the 18-kilometre transitway will have 12 stations between Winston Churchill Boulevard in the west and Renforth Drive in the east. As the largest infrastructure project in Mississauga's history, the Hurontario Light Rail Transit Project (HuLRT) will bring approximately 20 km of reliable, rapid transit to Mississauga. 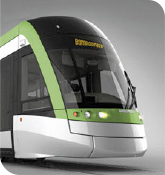 The system will run along Hurontario from the Port Credit GO Station to the Brampton Gateway Terminal. 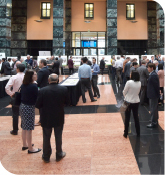 In 2016, Metrolinx and Infrastructure Ontario sought out qualified vendors to design, build, finance, operate and maintain the HuLRT. A request for proposal will be issued in 2017; construction will begin in 2018. Completion is targeted for 2022. The HuLRT will connect communities and accommodate future growth by doubling the corridor's capacity to move people, improve transit travel times and link the region's existing transit lines. In 2016, the City introduced a responsive, state-of-the-art Advanced Transportation Management System (ATMS). By allowing staff to proactively monitor and respond to traffic conditions the ATMS helps people move easier and faster around and through the city. The system helps manage travel conditions, better control traffic signals, share information and interact with other transportation networks. The City will continue to use intelligent transportation systems such as traffic cameras and vehicle detection. 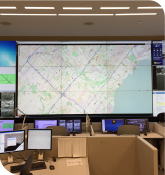 Further testing will help evaluate different traffic management systems across Mississauga. MiWay service continues to expand as ridership has increased by 70 per cent since the Mississauga Transitway opened in 2014. The results from the Transportation Tomorrow Survey will not be released until the end of 2017 or early 2018. The number of people living and working in the growth centre, transit corridors and nodes continues to rise each year. 1. Transportation Tomorrow, 2006. Transportation Tomorrow Survey Summaries. 2. Transportation Tomorrow, 2006. Transportation Tomorrow Survey Summaries. 3. City of Mississauga, Mississauga Data.